7 Diamonds 14K Anniversary Ring - 14K white gold 7 diamonds anniversary ring with infinity symbol on the sides. Diamonds together weigh approximately 1.50ct. The diamonds are graded as G-H in color and VS in clarity. 14K White Gold Anniversary Band - 14K white gold, 7 diamonds anniversary band. The diamonds together weigh 1.5ct and are graded as VS in clarity G-H in color. 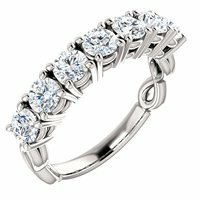 Platinum 7 Diamonds Anniversary Ring - Platinum 7 diamonds anniversary ring with infinity symbol on the sides. Diamonds together weigh approximately 1.50ct. The diamonds are graded as G-H in color and VS in clarity. Platinum Anniversary Band - Platinum, 7 diamonds anniversary band. Diamonds total weight is 1.50ct and are graded as VS in clarity G-H in color. 14K Gold Diamond Anniversary Band - 14 K white gold, 3.5 mm wide, anniversary band, holds 7 brilliant cut diamonds with total weight of approximately 1.0 ct. Diamonds are graded as VS1-2 in clarity G-H in color. The finish on the ring is polished. Other finishes may be selected or specified. 14Kt White Gold Diamond Anniversary Band - 14Kt White gold anniversary band. The ring holds 7 round brilliant cut diamonds each measures 2.4 mm in size. The diamonds are approximately 0.35 ct tw, VS1-2 in clarity, very clean and G-H in color, near colorless to colorless. The band is about 3.0 mm in width and each diamond is set with a single prong. The finish is polished. Different finishes may be selected. 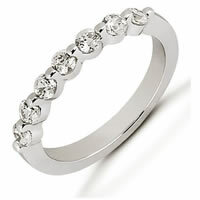 18Kt White Gold Diamond Anniversary Band - 18Kt White gold anniversary band. The ring holds 7 round brilliant cut diamonds each measures 2.4 mm in size. The diamonds are approximately 0.35 ct tw, VS1-2 in clarity, very clean and G-H in color, near colorless to colorless. The band is about 3.0 mm in width and each diamond is set with a single prong. The finish is polished. Different finishes may be selected. Platinum Diamond Anniversary Band - Platinum anniversary band. The ring holds 7 round brilliant cut diamonds each measures 2.4 mm in size. The diamonds are approximately 0.35 ct tw, VS1-2 in clarity, very clean and G-H in color, near colorless to colorless. The band is about 3.0 mm in width and each diamond is set with a single prong. The finish is polished. Different finishes may be selected. 18Kt White Gold Diamond Anniversary Band - 18Kt White gold anniversary band. The ring holds 7 round brilliant cut diamonds each measures 2.7 mm in size. The diamonds are approximately 0.49 ct tw, VS1-2 in clarity, very clean and G-H in color, near colorless to colorless. The band is about 3.5 mm in width and each diamond is set with a single prong. The finish is polished. Different finishes may be selected. Platinum Diamond Anniversary Band - Platinum anniveresary band. The ring holds 7 round brilliant cut diamonds each measures 2.7 mm in size. The diamonds are approximately 0.49 ct tw, VS1-2 in clarity, very clean and G-H in color, near colorless to colorless. 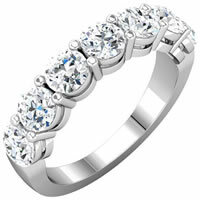 The band is about 3.5 mm in width and each diamond is set with a single prong. The finish is polished. Different finishes may be selected. Palladium Diamond Anniversary Band - Palladium anniversary band. The ring holds 7 round brilliant cut diamonds each measures 2.7 mm in size. The diamonds are approximately 0.49 ct tw, VS1-2 in clarity, very clean and G-H in color, near colorless to colorless. The band is about 3.5 mm in width and each diamond is set with a single prong. The finish is polished. Different finishes may be selected. Diamond Anniversary Band 14K White Gold - 14Kt White gold anniversary band. The ring holds 7 princess cut diamonds each measures 2x2 mm in size. The diamonds are approximately 0.35 ct tw, VS1-2 in clarity, very clean and G-H in color, near colorless to colorless. The diamonds are set in prong. The band is about 3.0 mm wide. The finish is polished. Different finishes may be selected or specified. 14K Gold Diamond Anniversary Band - 14K, white gold, comfort fit, approximately 3.5 mm wide 7 princess cut diamonds, anniversary band. Diamonds together weigh approximately 0.50 ct and are graded as VS in clarity H in color. The finish on the ring is polished. Other finishes may be selected or specified. 18K Gold Diamond Anniversary Band - 18K, white gold, comfort fit, approximately 3.5 mm wide 7 princess cut diamonds, anniversary band. Diamonds together weigh approximately 0.50 ct and are graded as VS in clarity H in color. The finish on the ring is polished. Other finishes may be selected or specified. 14K White Gold Diamond Anniversary Band - 14Kt White gold anniversary band. The ring holds 7 round brilliant cut diamonds each measures 3.0 mm in size. The diamonds are approximately 0.70 ct tw, VS1-2 in clarity, very clean and G-H in color, near colorless to colorless. The diamonds are channel set. The band is about 4.0 mm wide. The finish is polished. Different finishes may be selected or specified. 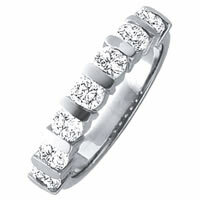 18K White Gold Diamond Anniversary Band - 18Kt White gold anniversary band. The ring holds 7 round brilliant cut diamonds each measures 3.0 mm in size. The diamonds are approximately 0.70 ct tw, VS1-2 in clarity, very clean and G-H in color, near colorless to colorless. The diamonds are channel set. The band is about 4.0 mm wide. The finish is polished. Different finishes may be selected or specified. Platinum Diamond Anniversary Band - Platinum anniversary band. The ring holds 7 round brilliant cut diamonds each measures 3.0 mm in size. The diamonds are approximately 0.70 ct tw, VS1-2 in clarity, very clean and G-H in color, near colorless to colorless. The diamonds are channel set. The band is about 4.0 mm wide. The finish is polished. Different finishes may be selected or specified. 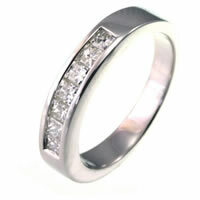 18K White Gold Diamond Anniversary Band - 18Kt White gold anniversary band. The ring holds 7 princess cut diamonds each measures 2x2 mm in size. The diamonds are approximately 0.35 ct tw, VS1-2 in clarity, very clean and G-H in color, near colorless to colorless. The diamonds are set in prong. The band is about 3.0 mm wide. The finish is polished. Different finishes may be selected or specified. Platinum Diamond Anniversary Band - Platinum anniversary band. The ring holds 7 princess cut diamonds each measures 2x2 mm in size. The diamonds are approximately 0.35 ct tw, VS1-2 in clarity, very clean and G-H in color, near colorless to colorless. The diamonds are set in prong. The band is about 3.0 mm wide. The finish is polished. Different finishes may be selected or specified. Palladium Diamond Anniversary Band - Palladium anniversary band. The ring holds 7 princess cut diamonds each measures 2x2 mm in size. The diamonds are approximately 0.35 ct tw, VS1-2 in clarity, very clean and G-H in color, near colorless to colorless. The diamonds are set in prong. The band is about 3.0 mm wide. The finish is polished. Different finishes may be selected or specified. 14K Gold Diamond Anniversary Band - 14 K yellow gold, 3.5 mm wide, anniversary band, holds 7 brilliant cut diamonds with total weight of approximately 1.0 ct. Diamonds are graded as VS1-2 in clarity G-H in color. The finish on the ring is polished. Other finishes may be selected or specified. 18K Gold Diamond Anniversary Band - 18 K yellow gold, 3.5 mm wide, anniversary band, holds 7 brilliant cut diamonds with total weight of approximately 1.0 ct. Diamonds are graded as VS1-2 in clarity G-H in color. The finish on the ring is polished. Other finishes may be selected or specified. Palladium Diamond Anniversary Band - Palladium anniversary band. The ring holds 7 round brilliant cut diamonds each measures 2.4 mm in size. The diamonds are approximately 0.35 ct tw, VS1-2 in clarity, very clean and G-H in color, near colorless to colorless. The band is about 3.0 mm in width and each diamond is set with a single prong. The finish is polished. Different finishes may be selected. Diamond Anniversary Band 14Kt White Gold - 14Kt White gold anniversary band. The ring holds 7 round brilliant cut diamonds each measures 2.7 mm in size. The diamonds are approximately 0.49 ct tw, VS1-2 in clarity, very clean and G-H in color, near colorless to colorless. 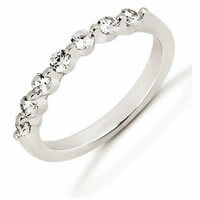 The band is about 3.5 mm in width and each diamond is set with a single prong. The finish is polished. Different finishes may be selected. 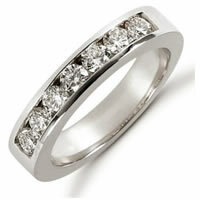 Platinum, Diamond Anniversary Band - Platinum, comfort fit, approximately 3.5 mm wide 7 princess cut diamonds, anniversary band. Diamonds together weigh approximately 0.50 ct and are graded as VS in clarity H in color. The finish on the ring is polished. Other finishes may be selected or specified. 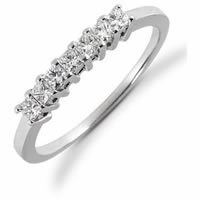 Platinum Diamond Anniversary Band - Platinum, 3.5 mm wide, anniversary band, holds 7 round brilliant cut diamonds with total weight approximately 1.0 ct. The diamonds are graded as VS1-2 in clarity G-H in color. The finish on the ring is polished. Other finishes may be selected or specified. 18K White Gold Diamond Anniversary Band - 18 K white gold, 3.5 mm wide, anniversary band, holds 7 brilliant cut diamonds with total weight of approximately 1.0 ct. Diamonds are graded as VS1-2 in clarity G-H in color. The finish on the ring is polished. Other finishes may be selected or specified. 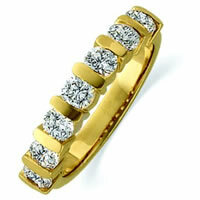 7 Diamonds 18K Anniversary Band - 18K yellow gold 7 diamonds anniversary ring with infinity symbol on the sides. Diamonds together weigh approximately 1.50ct. The diamonds are graded as G-H in color and VS in clarity.